There are few downsides to new observations, but confusion might be one of them. New stellar images bring mysteries that will take more time and effort to understand. That’s offset by how freaking detailed scientists can start producing these pictures, and of course, scientists like hearing that there’s more work to do. 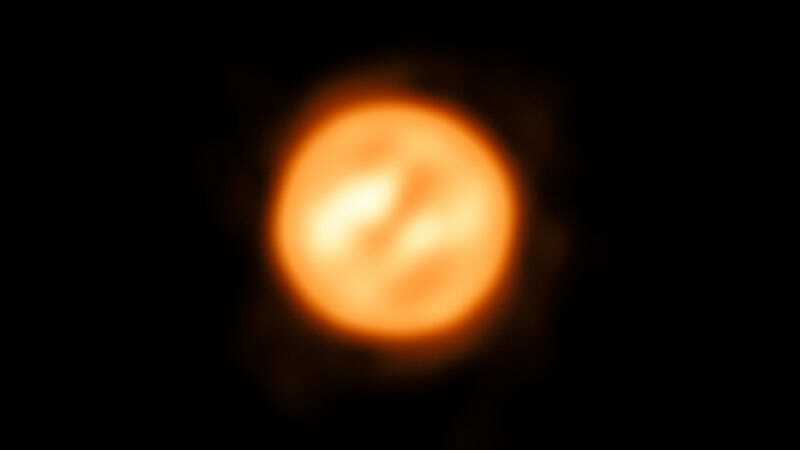 A team using the Very Large Telescope Interferometer (VLTI) at the Paranal Observatory in Chile captured this incredibly detailed image of the bright star Antares’ surface. The image is probably the most detailed image of a star yet (more detailed than this). Yet the new observations brought uncertainty in the form of quickly-moving gas clumps in Antares’ atmosphere. Antares is the brightest star in the constellation Scorpius, a red supergiant only around 555 light years away. It’s around 883 times larger in radius than the Sun; if Antares were the star in our own Solar System, it would engulf the orbit of Mars. The researchers observed the star’s infrared light on five days in 2014 using four telescopes through a process called interferometry, taking data from multiple synchronized telescopes and combining the observations afterwards, turning them into one enormous telescope. Then, they reconstructed the image with a special analysis algorithm. Aside from the detail, the researchers uncovered gases moving quickly—around 20 kilometers per second—far out into the star’s surrounding atmosphere. But the team realized that convection, the process by which matter circulates by heating and cooling as in a boiling pot, couldn’t account for just how far out the gas traveled—around 1.7 times the radius of the star. They noted that Betelgeuse, the star from which these astronomers stole the most-detailed-image-yet title, has similar motion, but the gas only moves a quarter as quickly. “The next challenge remains to identify the driving mechanism responsible for the observed turbulent motions,” the authors write. But, as always, with new data comes new mysteries. There are a crapload of things we simply don’t know about this universe we live in. This article has been updated to include a quote from Maria Bergemann.